After a week of heavy work at the office and frantic efforts to get the Heldrake to the competition, I found myself cruising calmly through Istanbul towards the museum grounds, with the model safely secured in a shoe box (well it’s a lot more innocent compared to what people carry in shoe boxes these days). Entry to the event and parking was free, with a quick gesture towards my model I was let in through security with no problems. And once inside, the looks change drastically. You’re greeted by a civilian aircraft in the parking lot, along with other aircraft and tanks all around. Nice panorama towards Haliç, Golden Horn. Once inside, I quickly registered my model for entry and strode towards the display gallery. Even early in the morning the place was quite busy, scale modelers trying to either put together complex models for display or discussing which category would best reflect their entry. I’m no expert in this but these models looked stunning. There were many contenders in the propeller plane category. One sub category literally had a squadron of Bf-109’s. Gotta love German planes! There were a LOT of tank entries. They all were beauties. It is difficult to accommodate so many choppers at once. Rotor blades get everywhere! At the time of judging the tables were very busy. By the time we hit midday when new entries were prohibited, there were so many models that required assembly of new tables! A quick trip to the local IKEA and some solidarity and the new tables were bustling with models of all kinds. After a quick session of rearranging models according to subcategories, the hobbyists were let inside along with some enthusiasts from the public. Check out below the different categories and the models that caught my eye. I realize now that most of the pictures I took are in the propeller and pre-1950’s category, but these were pretty much the best among a throng of models. As said, lots of love for the Messerschmitt. However I thought this stood up among others. Personal favorite among modern aircraft. Another nice contender for the Bf-109. 1/144 contenders. The F-18/A below in the diorama belongs to a fellow hobbyist from back in high school. This was hands down the best entry. It had a photobook next to it showing reference pictures and WIP steps. Ridiculously good. Again, very difficult to decide among so many great looking models, these entries stood out the most. One qualm about the categories I had was that there was no distinction between diorama models and stand-alones. This would be a recurring thing among other categories, including the one I competed in. Just look at this beauty. Great weathering, clean painting. Tiny models. For reference, the paper slips are a bit larger than my hand. Another great example of weathering and mud. A model with some scratch-build involved. Another great piece. … but a diorama really makes the model stand out. Lastly, a personal favorite. I love the Panther! The models in this category were very diverse, including galleons and warships from the World War era. As I am no ship expert, I photographed the ones that I found the most appealing. A stunning and large USS Arizona. I later found out that most work on it is by brush!! My personal favorite for the modern age ships. Hands down the most impressive ship on display, both huge and ridiculously detailed. … the Millennium Falcon?? Seriously, it was prepped on diorama with LED lighting for hyperdrive. A beauty to behold. Very large surface with lots of details. Great work overall. This was my favorite civilian diorama. Check out the bread pieces! This was very impressive, the siege of Constantinople. A whopping 2m of a battlefield. One of the best rubble work I’ve seen in the grounds. The rest of the model was a little lacking though. They even thought of the tunnelers (“lağımcılar”)! This deserves special mention. In memory of the events in Gezi Park last year, this diorama has almost all scratchbuilt models. The owner thought of including cops that throw gas grenades at protesters, bu time limitations inhibited him. Another favorite of mine. I wonder where the zombies are from. My favorite among the diorama entries. So much action in one picture! Guy shaving with a mirror. The water effects looked great! “Street level” shot. Looks so realistic doesn’t it? Now on to something I can comment on critically! There were quite a few models in this category, especially one that is dominated by real-life figures of land and air vehicles, so such a high amount of turnout was very pleasing. It was also very surprising to see that a lot of Citadel models were on display. However, I cannot say the same about the categorization of models, especially in my category. Overall, the larger, diorama type models were quite beautiful, whereas smaller, unit sized entries required a bit more work on them. The main sub-categories were Sci-fi/Fantasy figure models (where I competed), busts, single figurines and larger scale figures with dioramas. The photos will speak for themselves, but let me just note here that comparing a default pose Heldrake with diorama small-scale models was a bit off. There was another dragon right next to my model, so I assume our models just did not have enough contenders in their category. Here’s an overview shot of all figure models. Here’s my category, rearranged at the advent of new arrivals. Too bad I got pushed far back! Obligatory “Hey that’s my model!” shot. WHFB High Elf Archmage on Dragon. This was pretty much my only contender in my view. Pretty good work on the wings, but way too many spot colors to focus on one place. The only criticism I got was about weathering the large plates and using a 3rd color for the metallics through a wash. Frankly, I don’t know what to use for VLM colors. My favorite bust in the category. Such a vibrant model with an interesting pose. A close second in my view. Extremely good work on the metal plates. One of my favorite diorama figure models. Composition, water effects, interesting figures… what else do you need? Easily one of the best entries in the competition. I shot an overview of larger figures. All entries were very nicely executed, but very little application of soft blends. Special mention for the model using leaves. Well executed composition. An example of single minis in their category. Not stunning work to be honest, and there were quite a few of these on the table. A better application of blended colors. I liked the composition, but the model lacked extreme highlights. First time I see a complete Dreadnought. Didn’t know they were this small. Average paintjob. This was a great model. It’s very difficult to make a convincing case with dulled colors. And the photo really doesn’t do the model justice. The only model I liked that had proper highlights. Minus points for using push-fit models though. A great looking librarian among other models. Easily one of the best works. My personal favorite. Not that I have a soft spot for Space Wolves but the details on the model were very nicely accentuated. Hand down the best in my view. I have one last picture I want to show here just because I really like the idea of the category and the model was very nicely executed. 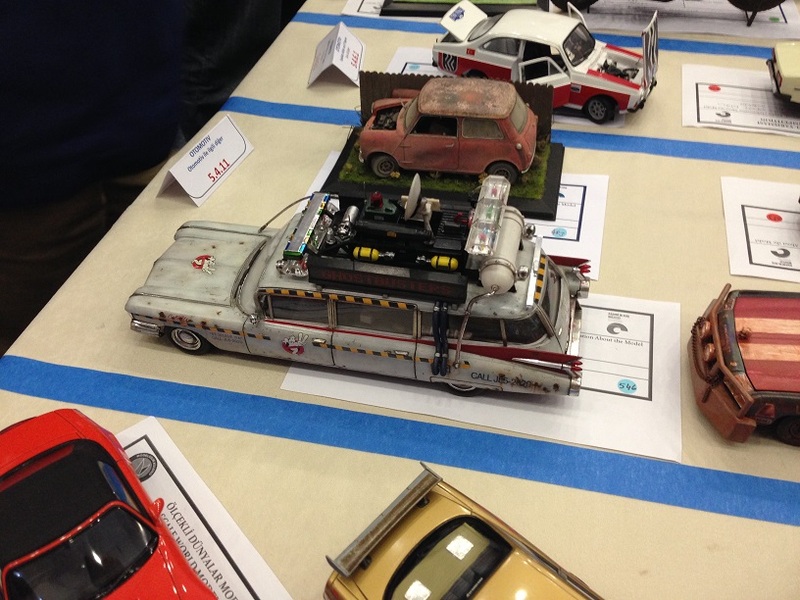 Here’s a Ghostbuster-mobile! Obviously this is not the complete tally of all the models but this covers pretty much the best among them. In the afternoon the judging of models began. Without a solid jury, the hobbyists were given score cards to assign points for models outside the ones they’re competing. So, I had to fill out about 30 or so categories with my favorite models. With 2 hours left to closing time, it would be no surprise to say that all went to hell with people trying to finish quickly and leave before traffic settled in! This is a point where next year’s competition could use a little more polishing. The butcher got 1st place, the dwarf got 2nd. 1st place winner in back, 2nd place in front. Among all the tanks, they picked this Pz III. Not very fair I think. The turnout was fantastic. Over 150 hobbyists, close to 700 models. For this reason a lot more space will be needed next year. Categorization was a complete mess. This definitely has to be revamped to accommodate unusual models. Some categories were dominated by 1-2 modelers that competed with themselves. This resulted in 1st, 2nd and 3rd place winners to be the same in many categories. Perhaps a limitation can be brought to how many models can be registered per category. Tied with the category chaos, the diorama models should really not compete with regular, standalone models. Besides, creating a large diorama pops the model out a lot more than the ones that stand toe to toe with others. Scoring took a total of 2 hours. In this interval 150 people moved around tables, over each other and sadly, over some models to appraise them. I myself was exhausted by the end that I couldn’t take a ton of time scoring models. Well, there you have it. It was actually quite an event that allowed me to meet some of the most friendly guys out there in the community, not realizing that they’re veterans of many years! As an example, the guy I mistook for the museum photographer who commented on my model (thanks for the praises by the way!) turned out to be the winner of the ships category! Just makes you feel humbled to be among such talented people who come together for a common hobby really. And on top of all of that, I got a LOT of ideas and references from the entries, which is always great. Even though I didn’t get high scores I learned a ton. Now that the competition is over, I can focus on the concurrent projects with a little more leisure. See you on the next post, probably on the Dreadknight! Wonderful photos. Thanks for sharing. What a great event. Sorry you didn’t get higher scores. Hard to judge things sometimes. I remember reading that for golden daemons, they rate technique difficulty highest of all…so even if someone has a better paint job, they tend to give a higher score to one that wasn’t as good, but was technically more difficult. I don’t think I could ever be a judge at one of these things. I do like that I could pick your heldrake out in the far away shots. It really stands out! My pleasure. 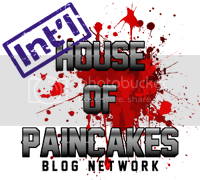 The community grows with more enthusiasts, and I’m happy to become a conduit for this! I think in Golden Daemon competitions they pick up and check every inch of the model, so you have to provide a model that can be handled easily. In this one people merely passed by, and if interested, peered in for a closer look from above. All that vent work underneath was for naught!